The promise that all children globally would have primary education by 2015 - pledged by world leaders in the millennium year - has officially not been achieved. Unesco says there are 58 million children without access to primary school and 100 million who do not complete a primary education. Only a quarter of countries achieved the goal of halving adult illiteracy. But Unesco boss Irina Bokova said there had still been "tremendous progress". This marks the final milestone for six global pledges, signed by 164 countries in April 2000, that were intended to systematically improve education over 15 years. Although none of them has been fully achieved by the 2015 deadline, Ms Bokova said: "Millions more children are in school than would have been had the trends of the 1990s persisted." There is a $22bn (£14.7bn) funding gap if the headline target of getting children into primary school is to be achieved, Unesco says. 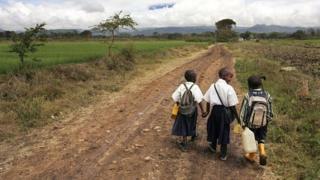 Those most likely to be missing out on school are girls from poor families, particularly in sub-Saharan Africa. As well as lack of funding, barriers to the creation of primary places for all included conflict, poverty, discrimination, poor governance, corruption and rising population. The UK is the most successful country in the world regarding the six Education for All targets, according to Unesco. There will now be another set of education goals set for 2030, which will be agreed next month at the World Education Forum in South Korea, before being approved at the United Nations in New York in the autumn. These are expected to place a greater emphasis on the quality of education, rather than concentrating on the number of pupils in school. Unesco has been monitoring the progress of the education goals - and despite the overall failure to complete the objectives, there have been substantial advances, which the UN agency describes as a "qualified success". There were 204 million children and adolescents without access to school in 2000 and that has fallen to 121 million, with the overall global enrolment rate in primary school rising from 84% to 93%. But there was far more rapid progress in much of Asia, with an increasing proportion of those missing out on school being concentrated in countries in sub-Saharan Africa. Nigeria, Chad and Niger were all highlighted for their lack of progress. In Asia, Pakistan was seen as failing to make sufficient progress. But Nepal, Afghanistan and Sierra Leone were among the countries making the biggest improvements in access to education.